Nature Line is happy to have launched its HELLO Juice summer campaign. HELLO Juices are simply delcious, healthy and refreshing - loved by adults as well as kids! You can find our cartoon juice characters all around our sunny Island. Billy the Banana, Pete the Pear, Sam the Strawberry & Penelope the Pineapple are a real crazy crowd! Catch our ads on Calypso & Bay Radio as well as our colourful billboard in Victoria Gozo! Look out for our posters and promotions in all local supermarkets. Purchase HELLO Juices from your local supermarket or grocery store or visit www.naturline.net product pg! You can also find more information on competitions, recipe's and more! You can also benefit from our summer campaign offer! 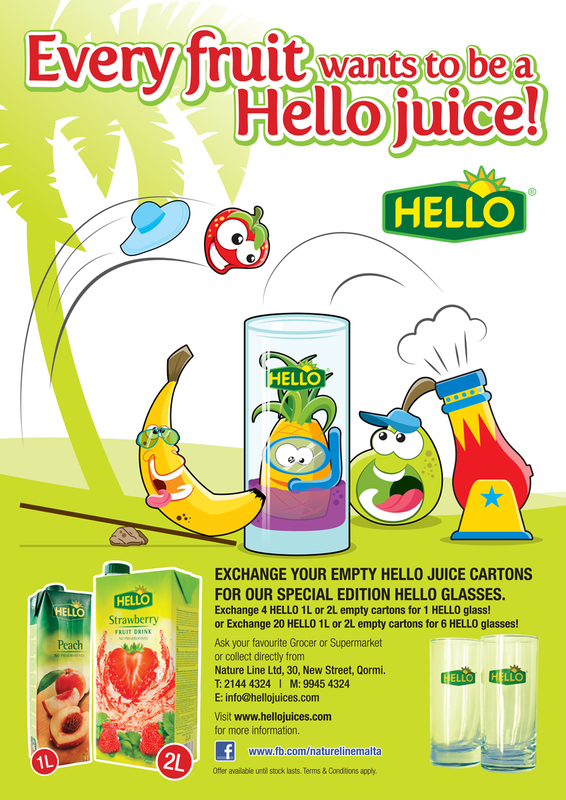 Exchange your empty HELLO glasses for our special edition HELLO juice glasses. Or for all those Juice lovers…. Exchange 20 empty cartons for 6 HELLO Juice glasses. One for all the family! Have a great summer everyone! HELLLLLLLOOO!